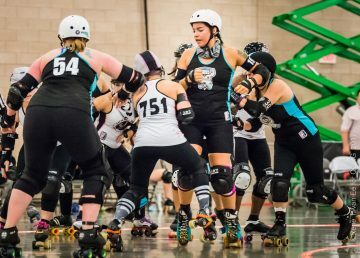 The Roller Derby World Cup is just around the corner, February 1st- 4th to be specific, and we have five Lake Effect Furies skaters heading across the pond to Manchester, UK to play for four different countries. KWOW and Crazy Squirrel will be representing our friends to the North as they don the maple leaf, wearing red and white to play for Canada. 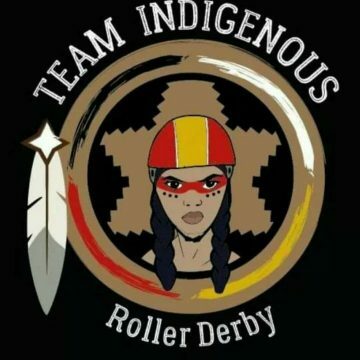 Representing a new team to the World Cup scene, Blackrock Bruiser will be playing for Team Indigenous, a team comprised of First Nations skaters from around the globe. There was more than one new country to join the World Cup this year, and Chickadeemolish is proud to be representing the Philippines as they embark on their first trip to play at the Cup. Lastly, Amazon will be representing Greece as they return to the World Cup for the second time. Before we delve deeper into each skaters’ journey, let’s talk a bit about the World Cup itself. The first one took place in December of 2011 in Toronto, Canada featuring only 13 countries to see the US and Canada face off in the final bout. The US swept the floor and came out victorious with Canada in second, England bringing home third and Australia rounding out the top four. Three years later in 2014, the second World Cup took place in Dallas, Texas; and there were now 30 countries taking part. Even with that many new teams partaking, the top four were still US, England, Australia and Canada, in that order. Now fast forward a little over 3 years and we’re only weeks away from the third RDWC featuring an impressive 38 countries. With the way that WFTDA Champs went this year with a non-US team winning for the first time, we can be sure that the World Cup will be just as exciting and that another country may just take over the first-place spot. Now let’s get to know the Furies that are playing, as one of them might just be on this year’s winning team. 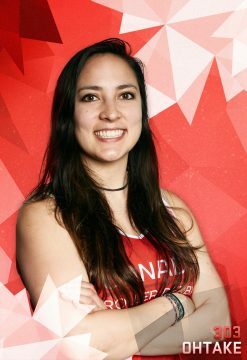 Returning for her second World Cup, Kwow is one of the Team Canada captains leading the charge. 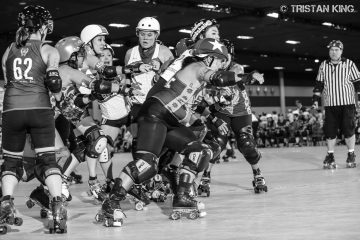 Her journey to the RDWC started in November of 2013 when she tried out for the 2014 games at the end of her third season of derby. That year she played with Team Canada for games in France, NYC, EXDC, Montreal and Alliston in preparation for her first crack at the World Cup. 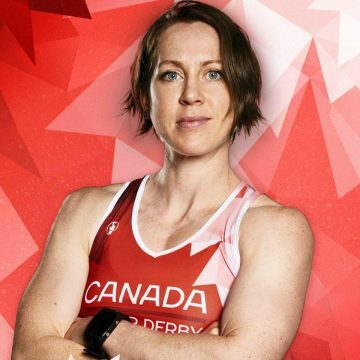 She was so dedicated to the sport and her team that she quit her job to make sure she got to Dallas and helped lead Canada to an impressive 4th place finish. She enjoyed all the great games they played, being able to walk in the March of Nations and just being able to soak up such an incredible event. She loved the feeling of being able to connect to her Canadian side through this team and she had her whole family rooting her. Her mom was just as dedicated and donated a beautiful handmade quilt to be raffled off as a fundraiser. You’ve seen her flying through the air at the Riverworks, and now we’re going to get to see this Squirrel flying over the apex in Manchester as she proudly wears the maple leaf. You can watch both KWOW and Squirrel with the help of Team Canada play on day one at 11:00 against Wales and a 4:00 against Russia on track one. One of the new teams in this year’s RDWC isn’t a country, but a group of women representing an important part of the world, the Ancestral Lands. Our very own Rocky is representing her ancestral people the Cayuga and Seneca. She said that she is proud to be standing with so many other strong, resilient, indigenous skaters. She heard about the team from former Devil Dollie coach Mr. Murph and teammate Librawlian who encouraged her to submit a tryout video. After much hemming and hawing, she went ahead and did and made the team. Due to the nature of the team, their only meetings so far have been over the internet, but the team will be getting together a couple days before the RDWC to practice skating together. “I’m looking forward to hitting the track with such an important group of women, hearing about their journeys, absorbing all their strength, healing through knowledge and being able to bring indigenous issues to the forefront for a strong more united future,” said Rocky. Watch Rocky and Team Indigenous take on Italy at 10:00 on track one and then face off against Iceland at 7:00 on Track three. The Furies shortest and fiercest blocker, Chick, will be taking to the track with a like sized group of skaters and showing the world, what Filipinos are made of. Chick was made aware that Team Philippines was looking to put a team together by Mr. Murph, and naturally she had to take the shot. 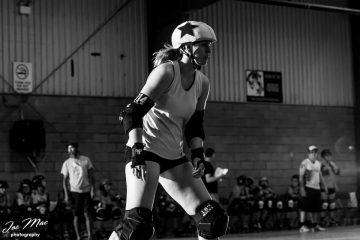 After submitting a video of her playing some derby with the Furies, it was clear that she was going to joining them on the road to the RDWC. Since then the team has played together once at RollerCon against Team Korea, with their first practice together actually after that bout. Chick has also been a trainer with them at Planet Derby Training Camp in October which helped the team to collaborate and bond together. Having only regularly skated with a couple other Filipinos, Chick is filled with so much pride to be taking the track with a whole group of strong and competitive skaters. “I’m looking forward to being able to compete and learn from skaters from all over the world,” said Chick. “There really isn’t another opportunity for this much derby diversity anywhere else and I can’t wait to represent my family’s country, QCRG and the Furies on the World Cup track.” Catch Chick and the skaters of team Philippines playing on the first day at 1:30 against Czech Republic and at 5:30 against Sweden, both on track four. Playing for her first time in the RDWC, Amazon is excited to represent Greece this year, a team made up of skaters from all over the world with a Greek background. It’s a team that is made up of skaters of all different skill levels, from those new to the sport to D1 skaters and even some that play on banked track. After making a comment on a Facebook post in 2014 about being a Greek derby player, she was asked to join the team for the 2014 RDWC, but she declined because she didn’t feel ready (it was only her rookie year). This time around she reached out and asked if the opportunity was still there. She was graciously accepted and said “I am excited to play with a group of skaters who have an equally large love of feta cheese and am looking forward to learning more about my family’s Greek heritage from my new-found teammates.” The team will be meeting for the first time on January 26th where they will be spending four days training in Birmingham. During their training they’ll be having a chance to scrimmage against Birmingham, West Indies and Romania to help them gel together and able to read one another. “I’m really looking forward to the game against Team Aotearoa as it’s against many top level VRDL skaters; particularly WFTDA Champs MVP, Lady Trample,” said Amazon. On the first day of the RDWC you can catch Amazon and team Greece face off against South Africa at 12:30 on track two and Team Aotearoa (New Zealand) at 4:30 on track four. We also have some awesome QCRG members heading over to the RDWC to cheer on their fellow leaguemates, so thank you everyone for all the support. We wish all our skaters good luck and can’t wait to see them all play their hearts out for their respective countries. For the moment we only know the game schedule for February 1st, so keep an eye on our Facebook page as we’ll be doing our best to keep you up to date on the skater’s activities while they are in Manchester.